Students, are you looking for a job or internship? The STEM Career & Internship Fair is the place for you! Come to the Glick Ballrooms on the fourth floor of the Joe Crowley Student Union on Thursday, Feb. 14 from 10 a.m. to 2 p.m. to find a career opportunity, part time or seasonal job or internship. Bring your resumes, and dress for success! 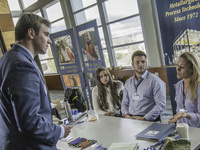 Employers will be looking to hire STEM undergraduate and graduate students from a variety of the most in-demand disciplines for hundreds of positions, full time and part time, both on and off campus. Below is a list of the companies that have registered for the fair so far. Keep an eye on the website, www.unr.edu/stem-career-fair/students. It will be updated as more companies register to attend!